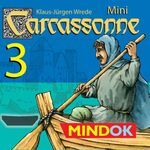 These are my favorite expansions to use for a 2-player game of Carcassonne. What expansions do you prefer for 2 players? All base tiles. (The new ZMan edition includes River 1, which I don't use in 2-player games). All expansion tiles (with Inn and Cathedral scoring) + Big Meeple. All expansion tiles + Builder. (Trade Goods and Pig not used). All expansion tiles + Abbey. (Mayor, Wagon, Barn not used). 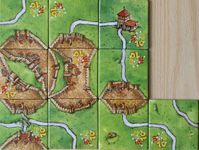 King/Robber expansion tiles (but not King/Robber tiles or scoring). (Cult sometimes used to counter Cloisters; Count, River 2 not used). Only non-bazaar expansion tiles (4). (Bridges, Castles, Bazaars not used). Included sometimes for road scoring tactics. Included sometimes for meeple retrieval.